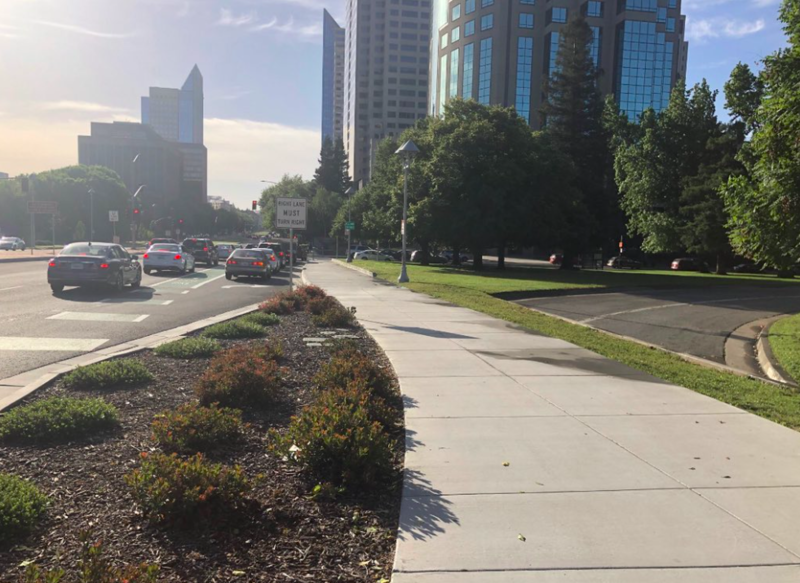 When you come across a short segment of asphalt that carves up the sidewalk so drivers can take turns faster — that’s a slip lane, and it’s very dangerous for pedestrians. Slip lanes don’t belong in cities. Since slip lanes serve no purpose except to shave a few seconds off car trips, they’re easy to convert to pedestrian space. And many cities are doing just that. Inspired by this photo of a slip lane removal from Streetsblog Chicago’s John Greenfield, we asked readers to send in photos of slip lane conversion projects from their cities, and we got submissions from across the country. Here’s a look at what people sent us. This plaza in Philly is made out of temporary materials but has been in place for several years. 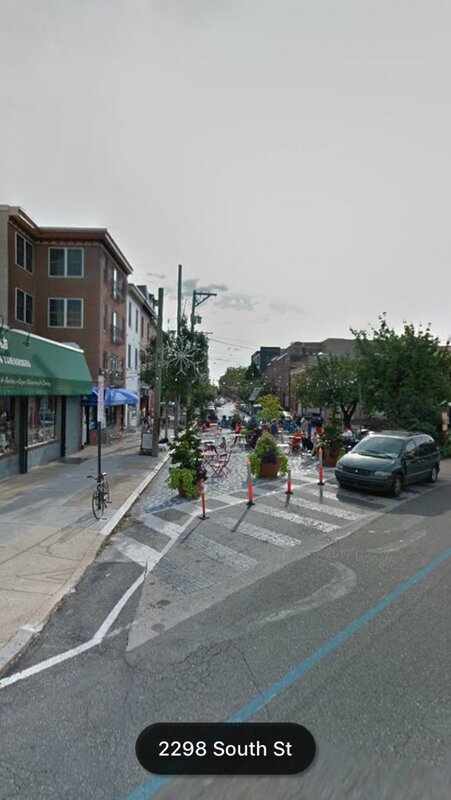 The city intends to build out a permanent version, Plan Philly reports, that will provide more shade. You can see where the asphalt has been filled in to create a nice continuous sidewalk and a landscaped buffer. Thanks to Paul Supawanich for bringing it to our attention. LADOT’s “People Street” program dramatically changed this short block using just planters and paint (via Carter Rubin). Maybe the nation’s most famous slip lane conversion is in Seattle’s Capitol Hill neighborhood. 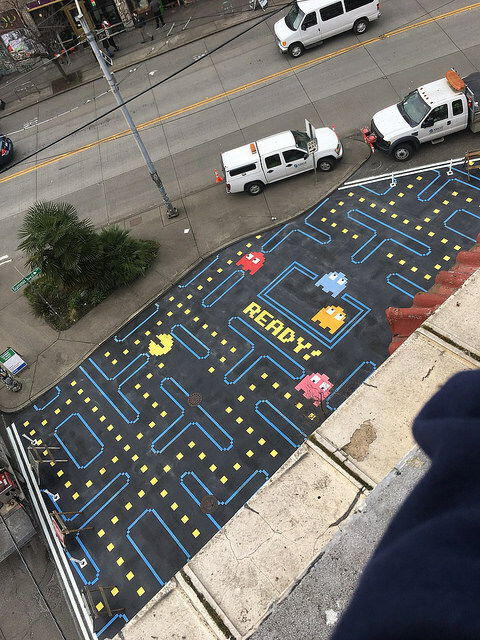 The city asked residents to help redesign the space and the Pac Man concept won. The city of Austin is currently testing out a public plaza at this location with temporary materials. The plan is to build out a permanent project if public feedback is positive following the one-year pilot. What used to be a driving shortcut is now a bike-share station with a street mural from NYC DOT’s Urban Art program. The city placed big rocks on both ends keep drivers out. Cheap, simple, quick, lovely. 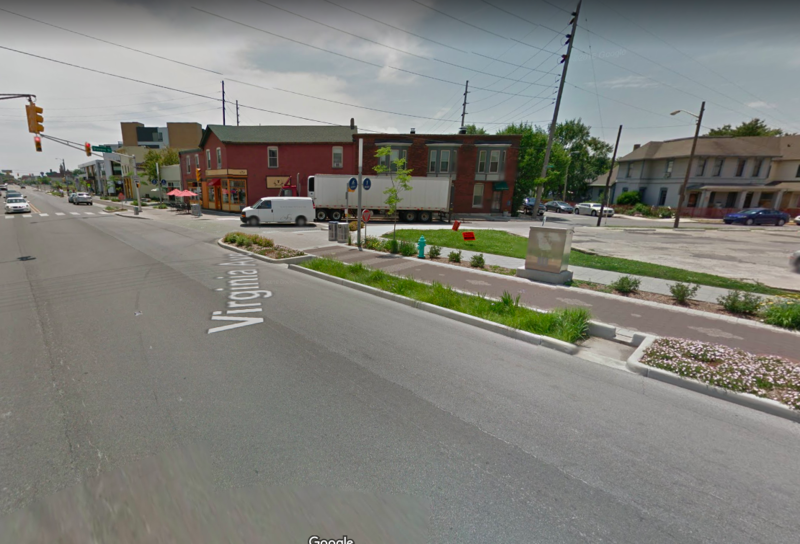 This slip lane was converted as part of the Indianapolis Cultural Trail project, showing once again how bike infrastructure can make streets safer for pedestrians as well. 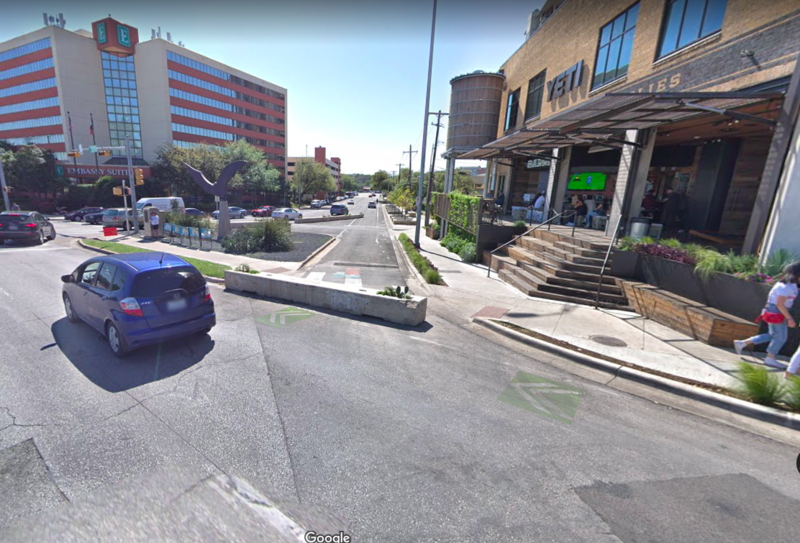 This submission from Bartek Komorowski illustrates how slip lane conversions can make a big difference in a more suburban setting. I’d add DC! This massive slip lane was closed a few years back. This one in Atlanta turned 2 lanes of traffic that diverged at high speed into a walking and cycling path!!! Incredible! I wish we could lose every slip turn in Berkeley. 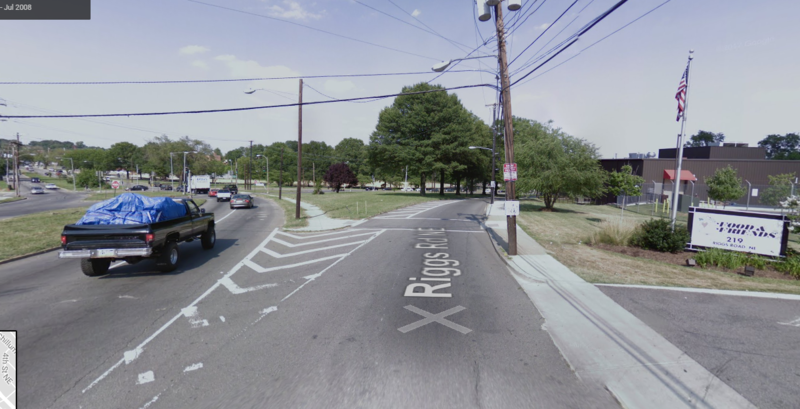 There’s even one at a very minor intersection, where a 5-year-old kid got killed by a car. 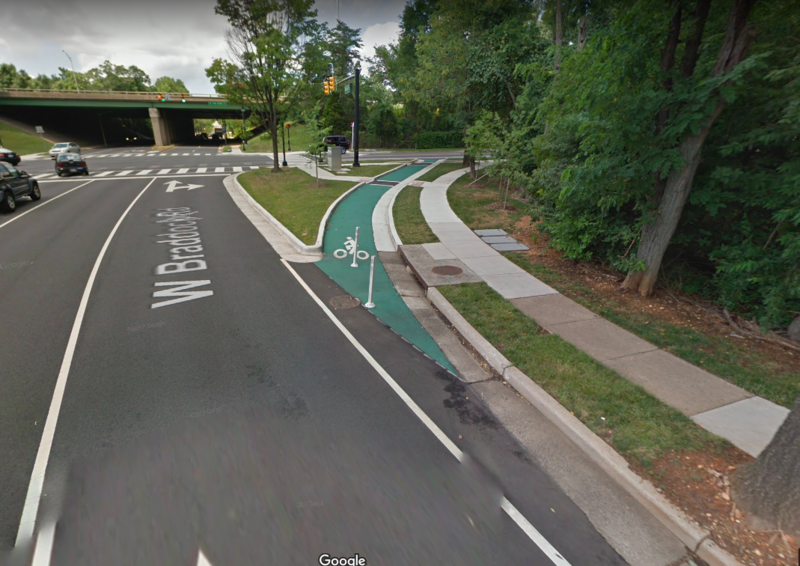 It’s “Zachary’s Corner” but even the basic safety improvement of squaring off the slip lane hasn’t been and probably never will be done. 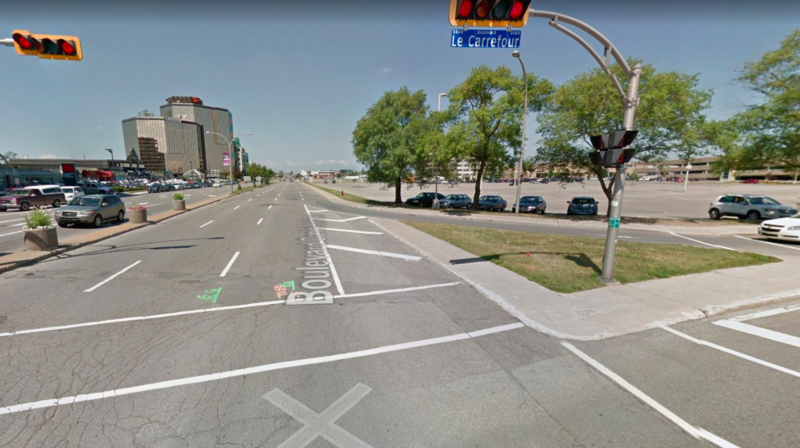 That Quebec example is pretty much exactly what I’d love to see happen on all the big 6-lane arterials in Silicon Valley. Because of cul-de-sac street grid design, there’s sadly no way to avoid them for most bike trips, but they have plenty of space for fully-separate bike paths (some of them even have wide medians planted with trees to separate the two directions of car traffic, but not even a painted buffer for the “bike lane” (which is really just the gutter). Not too many slip lanes there, but plenty of far-too-wide turning radii. 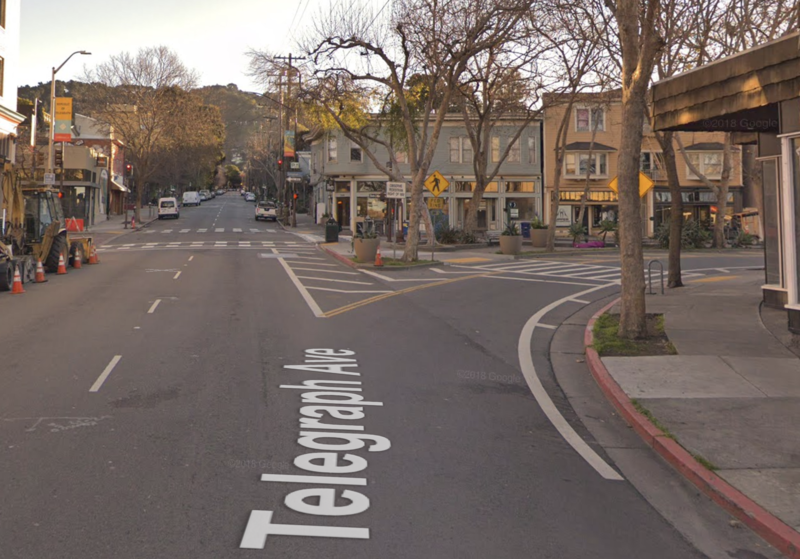 I can think of at least one slip lane in Berkeley that was converted to bike-only some years ago: the one at the corner of Hearst and Oxford. 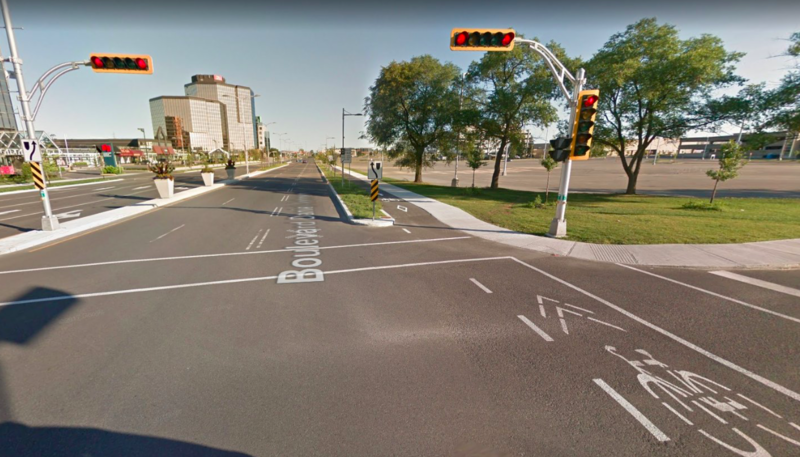 These projects are great, relatively cheap and really make it apparent how much public ROW is wasted to facilitate unnecessary (and dangerous) traffic speed. Now trees are considered to be street clutter? Interesting! I think it has “always” been that way since I moved here in 2009, so I didn’t know that was converted from a car lane. 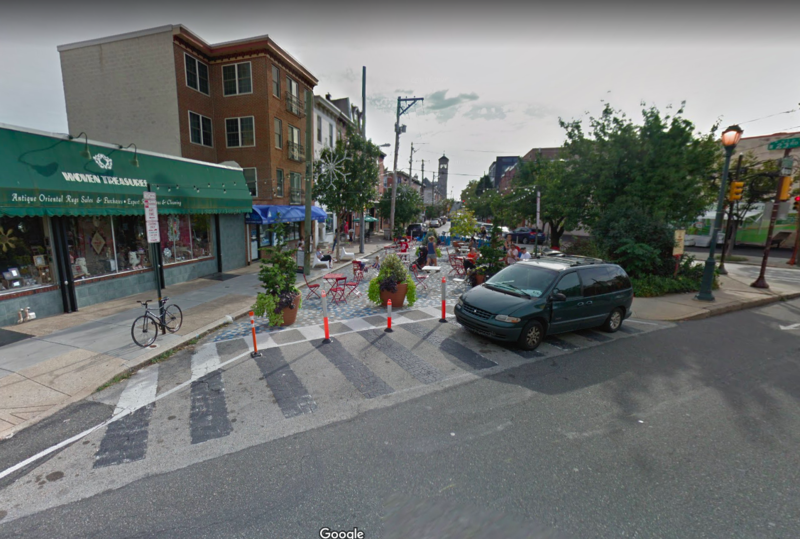 The Philadelphia example at 23rd and South was an easy conversion as it has been over 50 years since the street operations were changed so that auto traffic no longer could flow though the area. Of interest is that when I was growing up nearby the center area contained a set of drinking areas for the horses the pulled the ice wagons, the milk man’s cart, and the carts of the vegetable vendors. I think the fountain is still there in some form but was not operable the last time I visited. Many of those aren’t slip lanes; they are skewed intersections where short street segments cross at something other than a 90 degree angle. Skewed intersections present challenges to bicyclists and pedestrians, but they aren’t the same as slip lanes. 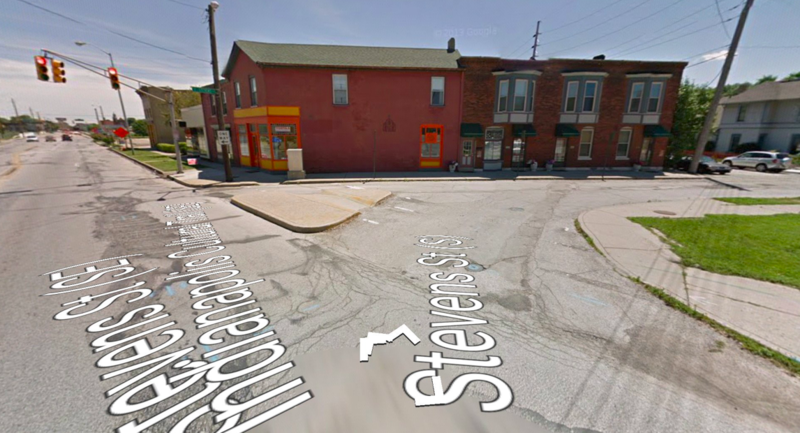 And we need to get rid of the one at Bancroft/Fulton, which is a real danger to northbound bikes on Fulton. We have a good chance of getting rid of this one when they extend the Bancroft Bike Track west of Fulton. We have already gotten rid of one at Oxford/Allston, in addition to the one at Oxford/Hearst. 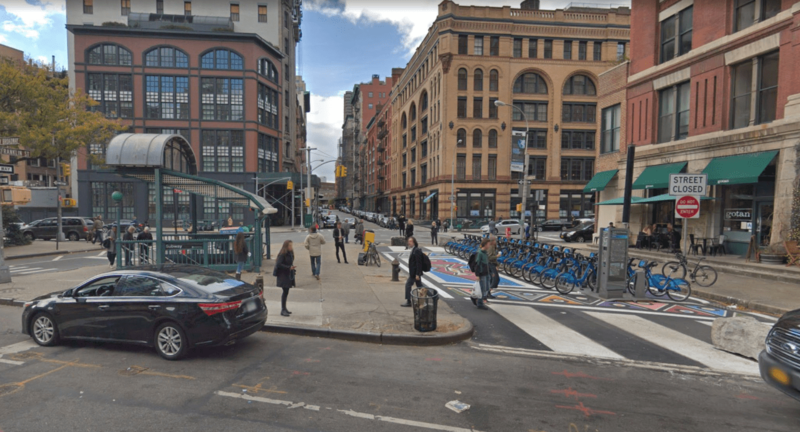 Hey, if you zoom in and out of the Google street view, it morphs from an arial view of what it used to look like, to what it looks like on the ground now. Kinda cool. It looks like lots of other transportation planners were listening when she spoke. Hooray!